Introducing a fresh perspective on family wealth management, with insightful solutions to the challenging problems of preserving wealth and investing successfully in turbulent times. This book is the product of a truly international effort, bringing together two co-authors on opposites sides of the world to address a topic of global importance. Mark Daniell (from Europe/ Asia) is a former director of Bain & Company and the chairman of two of the world′s largest family trusts. Tom McCullough (from North America) is the Chairman and CEO of Northwood Family Office and professor of Private Wealth. 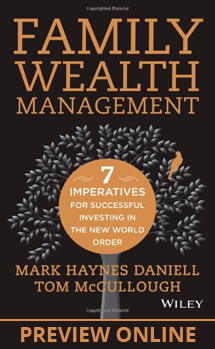 Family Wealth Management provides a solid, practical framework for investment management and long term family wealth preservation and is an important reference guide for family members and wealth managers around the world. Order at Amazon.com, Amazon.ca, Amazon.co.uk or John Wiley & Sons, Inc.
Read the rave reviews from many in the family wealth management community.